Hillcrest Residences is majestically perched on Bukit Jambul at approximately 57.5 metres (188 feet) above sea level, commanding panoramic views, adjacent to a Robert Trent Jones Jr. designed golf course, luxury bungalows and the award-winning 5-star Hotel Equatorial. It is surrounded by lush greenery and is a mere 6-minutes drive from the Penang International Airport and the Bayan Lepas Free Trade Zone. 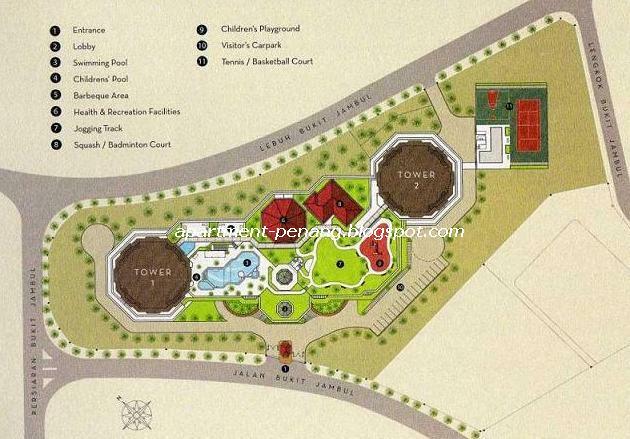 There is easy access to restaurants, shopping malls, hospitals and many other amenities. 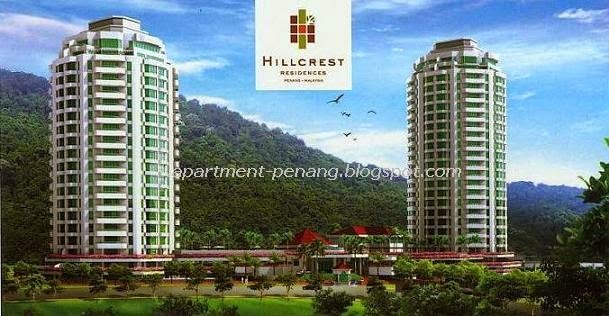 Spread over a generous 5.4 acres, Hillcrest Residences is possibly the lowest density high-rise residential development in Penang. With just 65 units in Tower 1 (Phase 1), 79 units in Tower 2 (Phase 2) and at only 4 units per floor, it is set to become the most sought-after luxury address on the island. Each residence has a floor area of approximately 2,227 sq.ft., sized generously to cater for the comfort of modern family. Each tower is adequately served by three lifts. Quality finishing and fittings area provided. 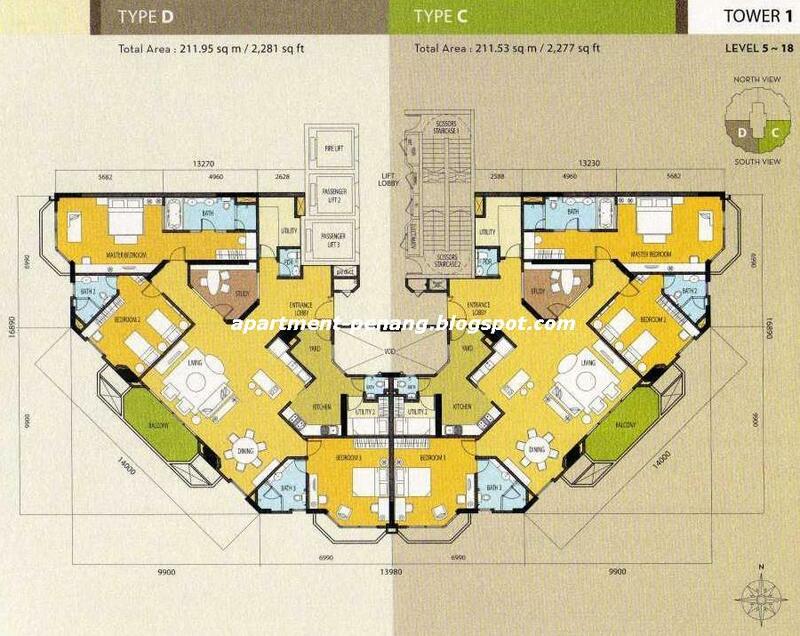 Built-up Area : approx 2,227 - 2,287 sq.ft. 24-hours security, covered car park, visitors car park, swimming pool, children's pool, landscape garden and recreational park, children's playground, jacuzzi, steam and sauna, gymnasium, squash court, badminton court, tennis court, BBQ area, jogging track, meeting rooms, lounge, games room, multipurpose room, launderette, broadband Internet infrastructure, satellite TV (ASTRO) Master antenna. May i know the price please. This condo develop by the Equatorial Hotel boss. Looks good with view also. do you have any official website and the address of the show room? Any advice on the pricing of this property? Hillcrest was not ready in December 2008, as said. It may be ready for occupation around December 2009. Not sure whether it's worth for RM700K++ luxury condo with leasehold status. But for sure the environment is nice. February 4, 2010 at 12:52 AMTACman! Good News to all Hill Crest Residence Owner. OC obtained 27 March 2010 for Tower 1 & 2. Tower 2 open for sale then. 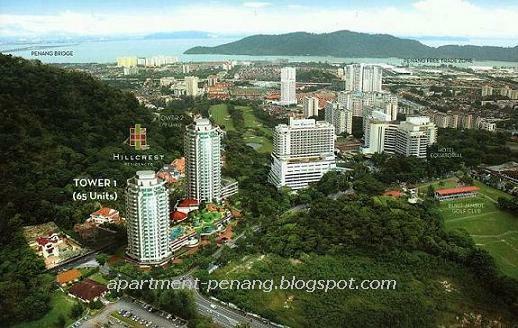 For the time being it is a leasehold property but the developer in the midst with PDC of converting to freehold. 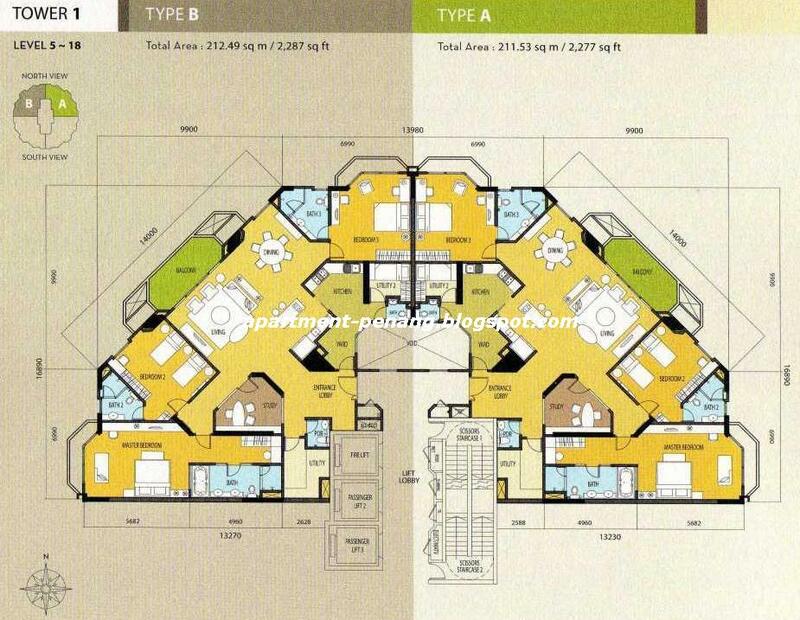 Condo is very nice, but price not very nice with the leasehold status, and environment near Fairview must sometimes have traffic jam because there are also a lot of bungalows there. I think the condo is a little too overpriced.It comes with leasehold status,furthermore you could buy one of those houses in SP Setia,or own a big bungalow in Juru Heights...this one is definetely outta my range. Anyone know why there has no occupancy yet although OC has been obtained on 27 March 2010? It must be crazy to spend 900K for a LEASEHOLD condo. The speculators in this condo are not very smart. I think this is a good example of cannot sell cannot rent at this moment. Just thinking on what earth this leasehold condo could cost the same amount as compared to a same size freehold terrace in a prime area. And more than 200k more than freehold condo like the view. i would appreciate if i could get some logic behind. I saw asking price is dropping to 790K. Still not worth to buy a Leasehold condo at this price. Speculators were speculated by developer. I understand that most of the landed on Bkt Jambul belong to Federal Government? No change to convert to Freehold? HOw is the condo doing lately? WHats the market rate now? Asking price now dropped to as low as RM630k nego. Thats RM100K below initial launch price back at start of 2008!!!!! Seems the original buyers miscalculated badly on this leasehold investment. Yet people are still buying for investment "the address" which is opposite of hillcrest. Goodluck to those lucky buyers for investment. seems like the price is still ~RM800k in mudah.. Seems a good place for own stay, with spacious and nice landscape, and superb facilities. What was the price transaction recently? New Bob Realty is aggressively promoting it as their marketing agent lately. Saw them in couple of property shows the past few weeks. Wonder why this place still have quite a few unsold units after so long. Could it because of leasehold ? or the weird layout ? Hello, i am considering to purchase on. Question 1)Why there are still available units from the developer. 2) what will be the price look like.can we pay 1.2 Mil for higher units.